Currently the ToWF Server software allows up to 4 Microphones to be connected and used at the same time (1 for each language). You’ll need a good Access Point – Enterprise-level, probably. A home router or home access point will typically only allow about 10-15 devices to connect, then various (usually weird) problems start to arise. So invest in a good access point to allow many to connect. A good priced one that I have experience with and would recommend is: Ubiquiti UniFi AP-PRO (the documentation says it handles 200+ simultaneous connections, though I’ve only tested up to about 30 connections so far). At the time of writing, it costs around $200. The software comes as a “.jar” file (download above). Next select the Sample Rate. Bigger number = better sound quality, but more network traffic. Type in the name of the Language and choose an Input Source, for each language you want to transmit. When you’re all ready, click Start, to start transmitting the audio over the network. As Receivers connect, they will appear in the Listening Clients section. This is just for informational purposes only. If something doesn’t work & you want to see more of what’s happening, you’ll have to run the app via the command line (see above), then check the terminal for error messages or warnings, which will hopefully lead you to the root cause. If you change the state of your system (e.g. add a USB Microphone, enable a Network Adaptor, etc) while the application is running, you need to Restart the application (close it, then start it again). It’s not smart enough (yet) to pick up the changes in real-time. To know for sure whether the Server is sending out Audio packets or not, a very useful tool is Wireshark. If the application is running and working properly, using Wireshark you’ll see a multitude of packets (each having a “ToWF” header) being sent out over the network. Wireshark can be installed on the Server or any other device on the local network. 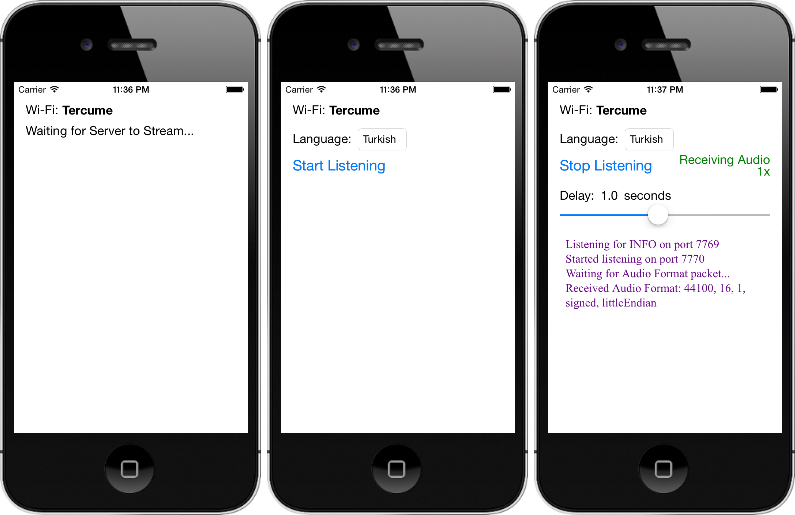 Receiver App – Waiting, Streaming, and Listening states (click to enlarge). 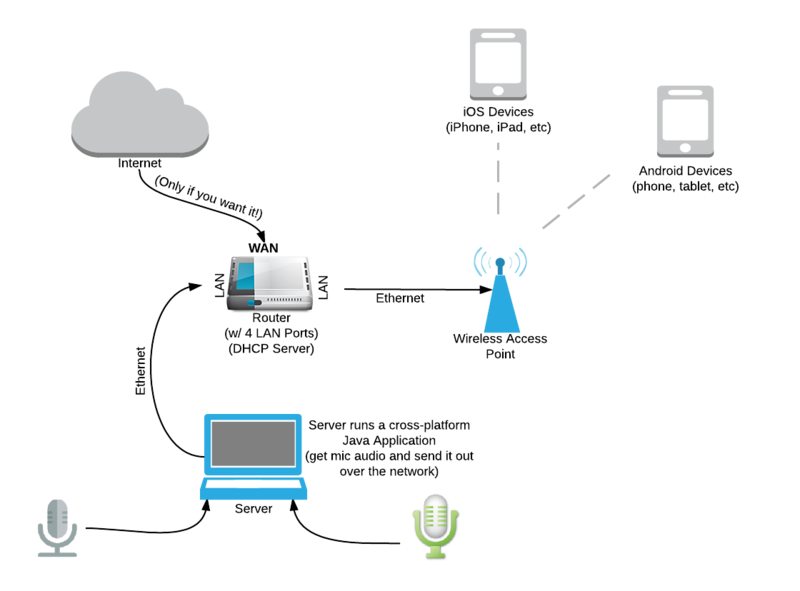 Streaming – The Server Application is streaming audio data. We can now choose which language we’d like to listen to, then click Start Listening when we’re ready. Listening – We’re now receiving the audio data and playing it. In the Listening state, you may drag the “Delay” slider back and forth. A smaller number means you’re audio delay will be closer to real-time, but because of that, your audio quality may suffer (because you’re buffer is smaller). The goal is to get the delay down as low as you can, while still receiving a good, clear audio signal. This will vary based on device and wireless interference. If the Server is streaming, but the Receiver App still says “Waiting for server to stream”, double-check that you’re connected to the correct Wi-Fi network – this is always listed at the very top of the app. In some cases, the Receiver App will say “Waiting for Server to stream” when in fact the Server IS streaming (and you’re on the correct Wi-Fi network). If this happens, kill the app and restart it (don’t just put the app in the background, but actually kill it).